Dubai: A selection of top athletes from Morocco and Ethiopia will go head to head with the UAE’s champion runners in this weekend’s President’s Cup 10,000 metres Olympic qualification event to be held at the Dubai Police Officers Club. The UAE’s Alia Saeed Mohammad and Betlhem Desalegn will be joined by an elite field of runners including Ethiopia’s world record holder Genzeba Dibaba along with countrywomen Senbere Teferi, Gotytom Gebreslase and Morocco’s Lalla Aziz Al Aouiselsouli, Bouchram Benthami and Amina Bettiche, among others. Alia and Desalegn have already qualified for the 2016 Rio de Janeiro Olympic Games with Alia making the 10,000 metres grade and Desalegn competing in the 1,500 metres. However, the UAE Athletics Federation (UAE AF) headed by Ahmad Al Kamali, want the athletes to take the next step forward. “We have a two-fold motive in organising the qualification event this weekend. We want a podium finish for one of our runners and at the same time we want a new national record in the 10,000 metres,” Al Kamali told Gulf News. The current UAE national record in 10,000 metres stands in the name of Alia who had finished in a time of 31:51.86 minutes at the 2014 Incheon Asian Games. She also won gold with a new Championship Record of 32:39.39 at the 2015 Asian Athletics Championships in Wuhan. “The idea is to break the race into two parts with Betlhem setting the pace in the first half in an attempt to push the rest of the field towards a faster time. Both our runners are capable of doing a fast race, but it also depends on the other girls especially the ones from Ethiopia, Kenya and Morocco,” Al Kamali said. Dibaba, the sister of three-time Olympic champion Tirunesh, was the 2012 World Indoor Champion in the 1,500m, and is also the reigning 2014 World Indoor Champion and World Record Holder in the 3000m. She represented Ethiopia at the 2012 London Olympics, but her major success was when she won gold in the 1,500m at the 2015 IAAF World Championships in Beijing. 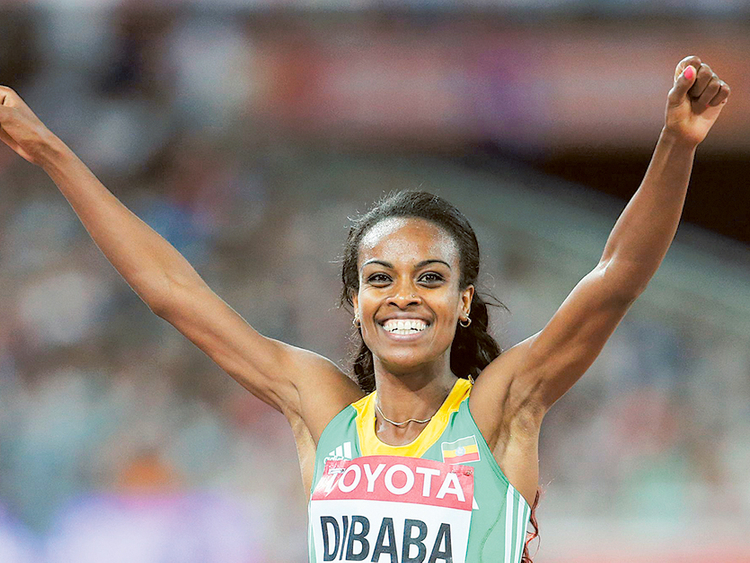 Dibaba was named Laureus Sportswoman of the Year in 2014 and was last year named the IAAF World Athlete of the Year. She has never participated in a 10,000m race before. As per the Qualification System and Entry Standard set up by the International Association of Athletics Federations (IAAF), women runners need a time of 32.15 minutes to qualify to the event in Rio de Janeiro. “We can see Alia bettering her existing time in the event. But I suppose the course of the race will very much depend on the rest of the field, especially the quicker runners from Kenya and Ethiopia. Perhaps, Betty [Desalegn] needs to add a bit more pace [for her 1,500m] and that is why we decided to use her as a pace-maker,” he added. Held under the patronage of Shaikh Ahmad Bin Mohammad Bin Rashid Al Maktoum, President, UAE National Olympic Committee (UAE NOC), this weekend’s Olympic qualification is expected to kick off at 7 pm at the Dubai Police Officers Club.